I went a little bauble crazy this am and just kept piling on the bling:) The middle one is from Bauble Bar, a site that I’ve already conveyed my passion for multiple times, and I’ve worn it every day this week so far.. Yes, I’m a little obsessed. 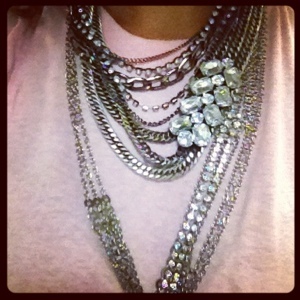 Love the pile-up of bijoux! Somehow, you make it look just right!